There’s a current trend among chefs to flavor foods and beverages with natural sweeteners and reduce the quantity used to produce a less-sweet taste. This recipe uses honey and vanilla to sweeten a goat cheese-based panna cotta. Dried cherries, fresh pears and apple juice naturally sweeten the compote. 1. For honey chevre panna cotta: Soften gelatin in milk and set aside. In large saucepan, combine the cream, vanilla bean and honey. Bring to a simmer over medium heat, but do not boil. Turn off heat and whisk in the softened goat cheese until cheese is totally incorporated and the mixture is smooth. Add the gelatin and whisk again to dissolve. Whisk in buttermilk and strain the hot mixture through a fine mesh strainer. Fill glasses or ramekins 3/4 full and chill for at least 6 hours. 2. For dried cherry-pear-thyme compote: In a saucepan, combine all ingredients and bring to soft boil. Reduce heat and simmer about 10 minutes. Remove thyme stems and store in refrigerator until needed. 3. 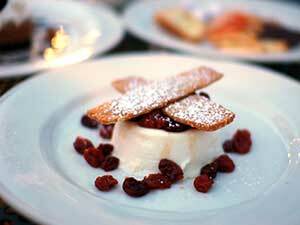 To serve, top honey chevre panna cotta glasses with dried cherry-pear-thyme compote. Serve with Greek honey cookies to add crunch.